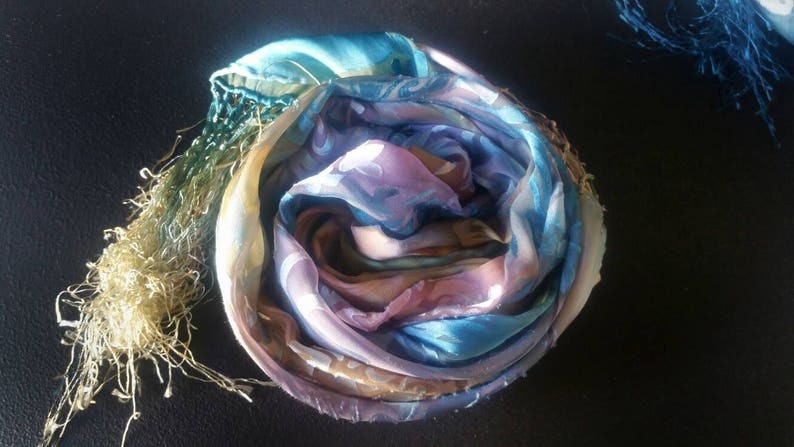 This sensuous silk shawl is dyed in delicious tones of purple, blue and yellow. I do not think I could achieve that same value of color again. It is definitely one of a kind. Note, the last photo shows how it looks without fringe which can be custom ordered. My expression of art is whimsical and wild. I love abstract and figurative art. Over my many years of painting, I found my own unique style as you can see in hand painted items in shop. I’m extremely influenced by nature because of the colorful world we live in. I am a swimmer and love anything having to do with water. I guess that is why the medium of silk painting was a natural for me. In my shop, you will find landscapes cityscapes, portraits, florals and abstracts.